The Junior Hacksaw Replacement Blades (4-Pack) help you easily finish small cutting projects. They are made with alloy steel for strength and have precision-set teeth to ensure efficient cutting. They are designed for cutting light alloy metal and other materials, and the blades are compatible with JHSC and 40124 Junior Hacksaw frames. The longest lasting utility blade in the world. DEWALT Carbide blades stay sharper 5 times longer than traditional competitive blades. DEWALT Carbide blades are designed to deliver increased blade life, maintain first-cut sharpness and offer snap resistance three key factors that today's professionals demand. Diablo's new Demo Demon carbide general purpose reciprocating blades are the first on the market specifically designed for both wood and metal. These blades include exclusive features that deliver unmatched 50 times longer life in both wood and metal cutting applications. With an oversized blade body, patented Variable tooth design, and Perma-Shield non-stick coating, this blade is ideal for cutting nail-embedded wood and demolition thick metal applications with a 1/8 inch to 3/8 inch thickness. The Diablo Steel Demon Carbide-tipped reciprocating blades are the first carbide-tipped blades designed for extreme metal cutting; including high strength alloys, cast iron, and stainless steel. This high performance carbide-tipped blade delivers unmatched 20 times longer cutting life than standard bi-metal blades in extreme thick metal cutting applications between 3/16 inch to 1/2 inch. The Diablo Demolition Steel Reciprocating Saw Blades are specifically designed for maximum performance in metal demolition applications. The 9-inch blades ultra hardened cutting edge delivers up to four times longer life than those of standard blades while the Dual Tooth design features a double tooth configuration with small gullets for faster material removal and extra durability. 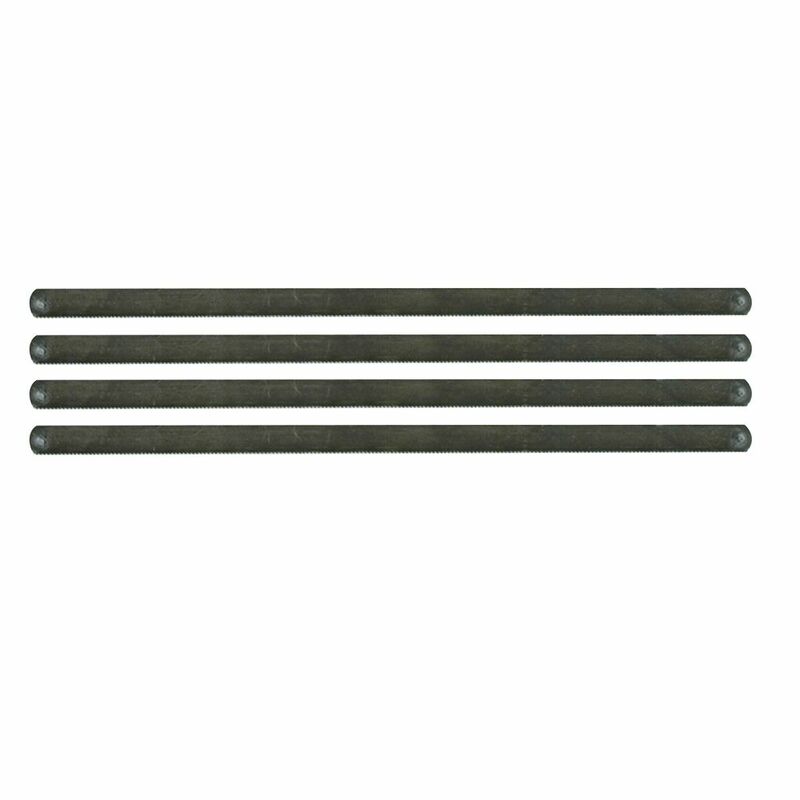 5pk Jr. Hacksaw Blades The Junior Hacksaw Replacement Blades (4-Pack) help you easily finish small cutting projects. They are made with alloy steel for strength and have precision-set teeth to ensure efficient cutting. They are designed for cutting light alloy metal and other materials, and the blades are compatible with JHSC and 40124 Junior Hacksaw frames.